Passages to the Past is pleased to welcome author SJ Garland to the blog today! SJ just released her novel Scot Rising, a thrilling mystery set in Stuart period Great Britain, and I have an excerpt to share with you! Please welcome SJ and enjoy her post! This is one of my favorite passages in Scotch Rising. I enjoyed writing it for several reasons, the first was imagining the family dynamics between Magnus, Beathan and Philomena. It took several attempts to get just the right amount of sibling rivalry between the two. The second reason I like this passage is because it is the first time Esmond meets Philomena. Our hero does not immediately fall in love with her and the two actually begin their aquaintence with a small dose of contempt. Part of me also likes the over rising social niceties all the characters in the scene must adhere to in order to be polite. I always think of it like a choreographed dance, enter gentlemen, ladies rise, curtsey, gentleman bows in return. Accepting the glass with a smile, I nodded in return, “Thank you for the invitation to dine. It has been many months since I graced a seat at a proper dining table, I will concentrate on not making a bore of myself this evening.” I lifted my glass to match Beathan’s salute and we drank together. The Scotch tasted incredibly fine, much better quality than I ever sampled in the past and I turned the glass over to admire the colour. I gave Beathan another salute and took another pull, I could definitely become accustomed to the smooth, smoky flavour of this Scotch, the quality so different from the bottle I consumed the past evening, I never would have thought it came from the same family still. “Beathan, I know ye would prefer tae keep the captain all tae yerself out there, however, Faither would enjoy meeting our guest,” a firm, soft voice called from the open doorway, the brogue similar to Beathan’s, light with only the touch of an accent to make it sound exotic. My companion shrugged his shoulders in apology and led the way into a large, stately drawing room, oil lamps and a few candles lit the large space, a fire burned in a marble hearth set on the opposite side of the wall, two delicate couches faced one another in front, one occupied by an older gentlemen and a woman no longer in the blossom of youth, however far from old. Everything in the room spoke the success of Deoch, from the gilt picture frames and mirrors on the walls, to the rest of the furniture grouped together to form smaller parties of conversation in the room, even the thick rugs underfoot felt lavish. “We dinnae stand on much formality here, Captain,” the old man stood and swept his sharp eyes over my attire. I knew he missed nothing from my bald head to my slightly scuffed boots. His own jacket, worn over a linen shirt to compliment his kilt, spoke of an expensive cut made to look serviceable and he wore a small wig with the long white hair caught in a black ribbon. I gave him a short bow, “A pleasure to make your acquaintance, Mr Clunes. Thank you for the invitation to dine, I informed Beathan on my arrival it is a rare occurrence for an old army captain.” Pretty words and platitudes may not be my trade, however I was not above a bit of flattery. “Nae, ye must call me Magnus, Mr Clunes is only fur folk who owe me coin or I owe them pose,” he sat back down on the sofa with a huff, and took up his Scotch, an example of a man not born to wealth or privilege, who may have never even aspired to either, yet he sat in the drawing room of a disgraced Lord and reigned over all he surveyed; he earned respect. “A pleasure to make your acquaintance, Philomena,” the unusual name rolled from the tongue and threatened to trip the unwary speaker. Dressed in a simple gown, with no bows or ruffles, she wore her hair in a severe bun at the back of her head, no wig and no powder on her face, not even the hint of a black beauty patch marred her creamy complexion. If we met by chance in a ballroom, or even in the street, I do not think I would have given her a second glance, though something in her green eyes warranted a second look; intelligent, not striking as my wife’s dark eyes and hair, any man meeting Onatah would fall immediately in love with her. Philomena turned to acknowledge a discreet cough from another doorway, nodding she turned back, “I think Cook is ready fur us,” she leaned down to help her father from the low couch and he held her arm as they led the way through to the heavily decorated dining room with a table set cozily for four, even though it could easily fit twenty diners. I tried to reconcile the fabulous display of wealth of both the drawing room and the dining room with the subdued appearance of my three supper companions; they gave no hint at the opulent tastes surrounding them; the room would be the envy of any society hostess in London. MURDER AND UNREST IN NEWLY FORMED GREAT BRITAIN -- English Aristocrat Tangled in Jacobitism Must Solve Mystery. Edinburgh 1707: The Acts of Union has just been signed bringing England and Scotland together as a united Great Britain. The controversial document brings unrest and the growing threat of bloodshed. Caught in this turmoil is Esmond Clyde-Dalton, a wealthy English soldier sent to the highlands of Scotland to collect taxes on Scotch. The reluctant Esmond quickly finds himself embroiled in solving the murders of two Scots men. As his investigation digs deeper, Edmond realizes that things are not as they seem. Ultimately, he will have to fight to save not only his life, but also the lives of the friends he has made in the highlands. Based on her extensive knowledge of the English Tudor and Stuart periods, author SJ Garland has created Scotch Rising, a thrilling piece of historical fiction. 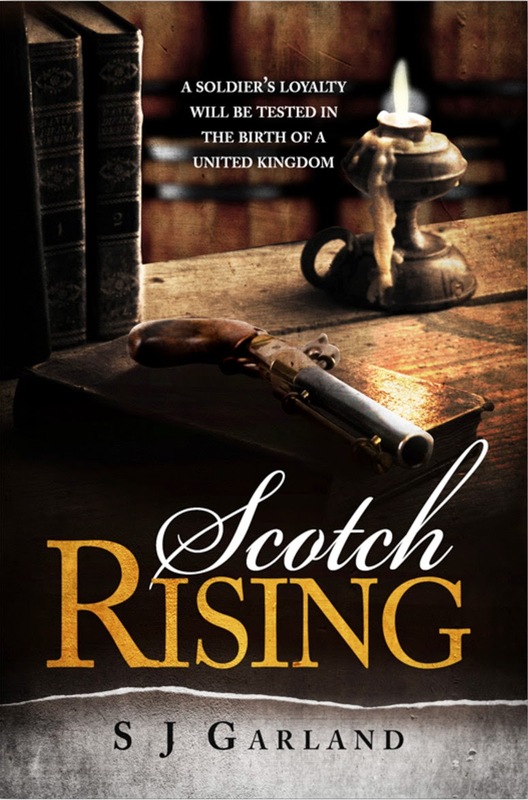 Filled with mystery, suspense and espionage, Scotch Rising explores the often tenuous English-Scottish relations during Jacobitism in the early 18th century. “I was inspired to write this story while visiting a local distillery with friends in the highlands of Scotland,” says Garland. “The idea of a solitary English man living in a small highlands village collecting the excise on Scotch felt like a great premise for a story. After several character and plot developments, the story of Esmond and Scotch Rising was born. It is fascinating to explore how the Act of Union came about in order to understand how later Jacobites were able to gain followers both in Scotland and in England,” adds Garland. Author SJ Garland has been an avid reader since childhood. Writing a novel has been a life-long goal. Garland holds degrees in History and English from Simon Fraser University and earned a Masters’ degree from City University, London. She has extensively studied the English Tudor and Stuart periods. She is a Gender Researcher for the Center for Excellence on Gender in the Himalayas. A native of Vancouver, Canada, Garland lives in Geneva, Switzerland with her husband. Garland enjoys reading and writing about her travels throughout Europe. To learn more, please visit http://sjgarland.wix.com/s-garland. Scotch Rising is available at Amazon.